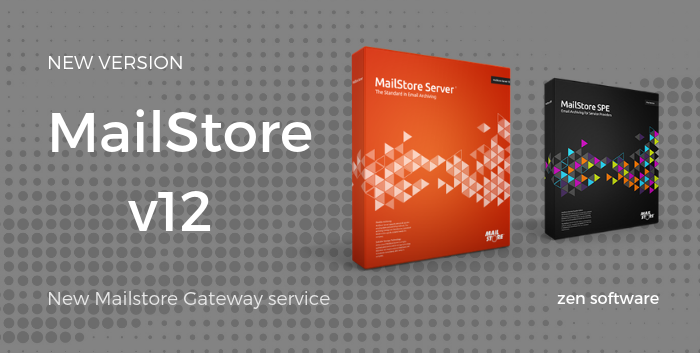 MailStore version 12 is now live and includes some great new features that will help tighten up security for all MailStore installations. In our opinion the best new feature is the brand new ‘Mailstore Gateway’ service that will make archiving Office 365 and Google G Suite mail much simpler to configure allowing you to use Journaling as the main archive method. 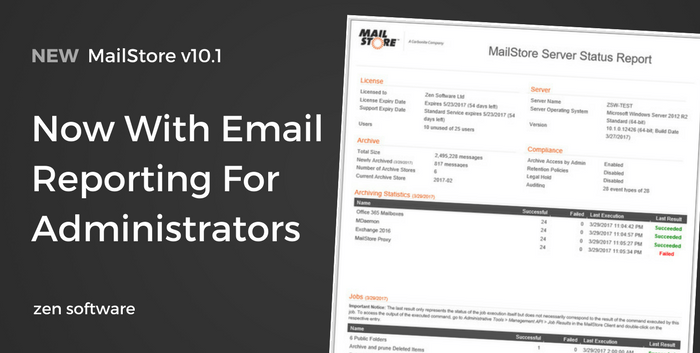 MailStore version 11 is now live and available for download from our Web site. 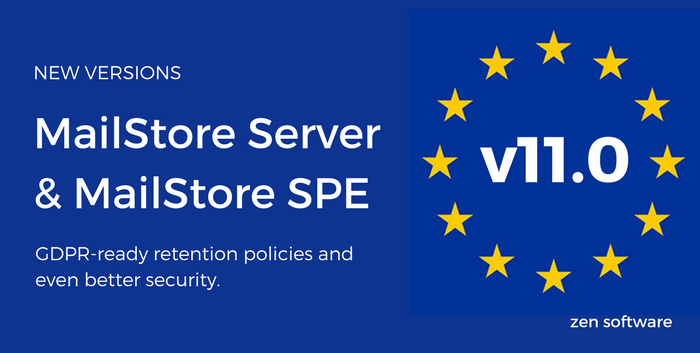 Just a few weeks ahead of the EU General Data Protection Regulation implementation, this timely release focuses on two key areas, security and compliance. If you’re wondering where email archiving fits into the GDPR piece, you might find our recent video ‘10 ways MailStore can help satisfy GDPR‘ and the official MailStore advisory PDF a good starting point. In this post though, we’ll take a closer look at the goodies v11 brings to users of both the Server and Service Provider Editions of the popular archiving software. We love the fact MailStore is such a versatile beast. It’s able to work with pretty much every mail platform on the market and satisfy the vast majority of requirements users throw at it. 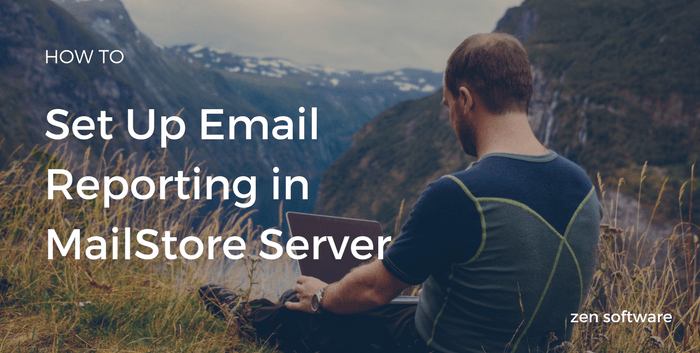 However, if you’ve got a large mail server running multiple jobs, or lots of hosted mail accounts, for example, it’s possible at some point that you could find yourself pushing the limits of your hardware or bandwidth. Optimising it isn’t difficult and largely boils down to how fast and how often you need your new email added to the archive. The temptation when setting it up for the first time is to opt for the ‘as fast as possible’ approach, when in reality you may be hammering your resources unnecessarily. 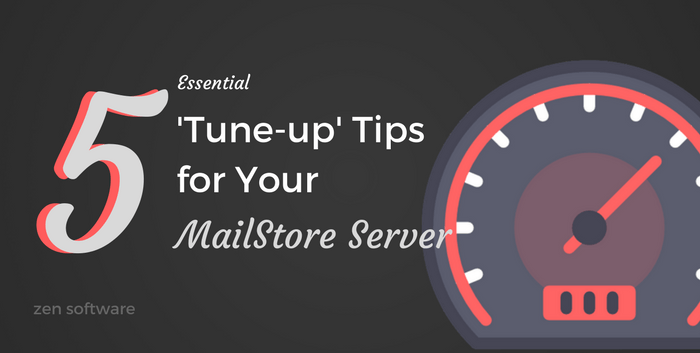 In this post, I’ll look at that and provide some simple tips for optimising your MailStore installation around your business needs. Almost exactly three years after its release and with 320 service providers under their belts, MailStore today introduce a new and simplified price model for the Service Provider Edition of their popular email archiving software for Office365, Exchange, MDaemon and other mail platforms. The changes will be welcome news if you’re an IT support company wanting to ‘dip your toes’ in the services market without a large upfront commitment. Plus existing customers should be pleased to see improved margins as a result of lower ongoing costs too. Straight out of the box, when you perform searches of your archived email as a MailStore user, it looks for your keywords in the header, body and subject of your messages. What you may not know, however, is that it also has the ability to search within some attachment types too if you enable the feature. I’ve found this to be incredibly helpful when looking back over conversations with customers, helping me find invoice or project references for example, and I’m sure you’ll find it useful in your working day too. Attachment searching is actually enabled by default, but it’s limited to only .txt and .HTML file extensions, so you’re not using its full potential. In this short post, I’ll show you how to enable the feature and get MailStore to re-index your historic email so it works for that too. Last week we let you know about the release of MailStore v10.1, the centrepiece of which was a simple but useful feature we’ve been asked for quite a bit – scheduled email reporting. You may be thinking, MailStore is German so there won’t be any issues to report on!? Well, not everything about your email is under MailStore’s control, so as an administrator, it’s still nice to see confirmation that your ‘Enten in einer Reihe’ occasionally. In this blog post, I’ll show you how to enable the delightful HTML report email, and let you know how to get the most from it.